This Mocktail drink is in tangy and delicious in taste. It is a homemade mocktail drink. 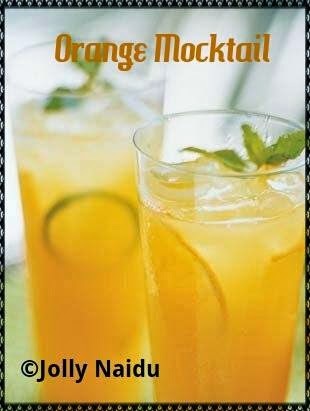 The tangy taste of orange combined with lime juice and are laced with sugar, soda charged with fresh mint. It is pure Non-alcoholic drink. There is some twist also. Here's a mocktail recipe for your summer enjoyment. 1. First, filter the juice alone from oranges. 2. Combine all the ingredients and stir well. 3. If you want to add soda, adding mint is very refreshing(take 2 leaves and crush it with your hands and it in). 4. Mix well, then strain it before serving. 5. Ready to serve it before serving Add slices of lime, orange in a glass & crushed ice to the drink. Note : A tbsp of ginger juice can add a different twist to the drink.